Several Carnival cruise ships use card key switches to conserve energy in guest cabins. The Carnival suggestion is to use one of your room keys - which often results in a forgotten key when leaving the room. So I have created the Light Card® card key switch activator! It consists of a PVC card with artwork printed directly on the card (making it waterproof & long-lasting!) and a magnet on the back. Put it in the slot while you're in the room, and then pull it out and use the attached magnet to hang it on the wall above the slot while you're out. No more forgotten room keys! ~~Important! Be sure to remove completely when you leave, as stateroom hosts are in the habit of grabbing the card in the slot on the way out and in their haste may inadvertently take yours! ~~Also, be sure to hang on the wall above the card slot and not on the door - the motion of the door can cause the cards to slide and possibly fall off. Can be used over and over for all your cruises using card key switch technology, and hung on your fridge as a memento in between! Please note - "How Many?" will be multiplied by "Quantity" selected to give final amount of cards ordered. For example, if you select 2 under "Quantity" and then "Set of 4 cards" under "How Many?" you will be ordering 8 cards (2 x 4). And don't forget luggage tags and lanyards! 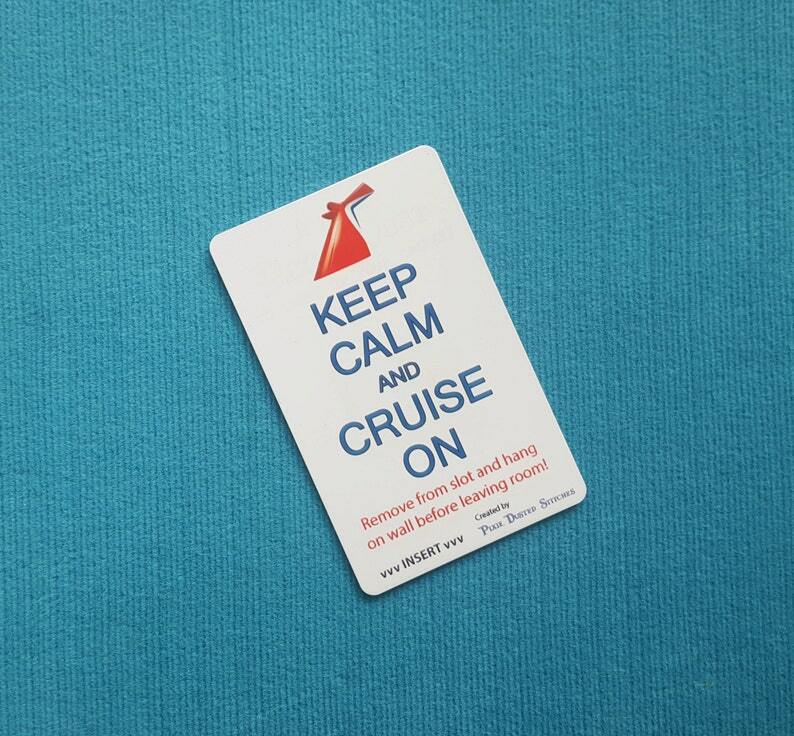 Keep Calm and Cruise On - Cruise Light Card® card key switch activator - For all cruise lines with card key switch technology! cards are perfect for cruising! Fast shipping! Going to be great to have this card for the lights so we don’t have to use our key card!! Great product and I received it quicky! Payment is accepted through Etsy Payments only. All handmade items will have slight variations/imperfections. This is the charm of handmade items! Therefore refunds/exchanges will be provided only if I send an incorrect item or an item is damaged in shipping. Photos will be required to show issue/damage and packaging may be required to be presented to your local Post Office to assist in USPS claims, so be sure to hold onto it until the claim is approved. Please message me with any issues and we can work it out! Please take note of the expected shipping date provided on each listing & in your cart during checkout and add 5 - 10 business days for USPS First Class delivery. If you need your item(s) sooner, Priority/Priority Express shipping upgrades (upgrading transit time only/expected shipping date does NOT change) are available on most listings, and Rush processing upgrades (moving up expected shipping date & upgrading to Priority shipping) can be found by searching "Rush" in my shop. Local pickup is available (zip code is 34734). Please contact me for arrangements after placing order. Shipping must be paid at time of order and will be refunded upon pickup. Orders not picked up as agreed will be shipped to the address provided to Etsy.